India’s first payments Bank, Airtel Payments Bank has announced that the company has opened over one lakh (1,00,000) savings accounts in Madhya Pradesh. Airtel said that approximately 70 percent of these accounts had been opened in rural areas. The telco commenced the Airtel Payments Bank operations back in January 2017. 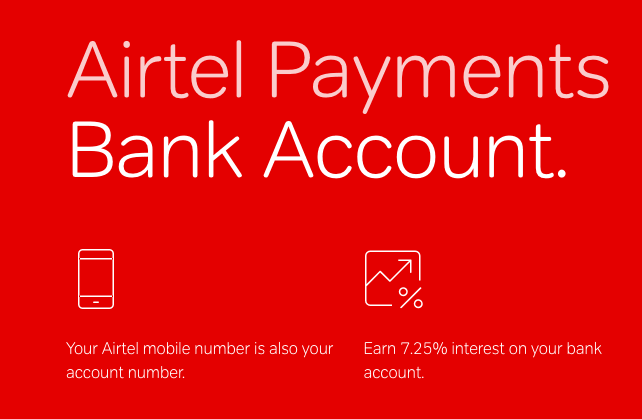 Airtel Payments Bank has been successful in most of the areas ever since its inception and Airtel has converted all its retail stores to banking points to store, withdraw, and open an Airtel Payments Bank account. As of now, the telco has announced its payments bank service in over 160 villages of Madhya Pradesh to go cashless. All these villages will now have access to essential banking services and the option of transacting digitally thereby making them less reliant on cash. Over 30,000 neighborhood Airtel retail stores across whole Madhya Pradesh are converted to banking points, and customers can open savings accounts, deposit, and withdraw cash across any of these banking points. A total of 2,50,000 Airtel retails stores are being converted to banking points across the country. Airtel has already partnered with over one million merchants across the country to transact via Airtel Payments Bank. As mentioned earlier, Airtel Payments Bank currently has a network of over 250,000 Airtel retail stores, which also function as banking points. This is more than the total number of ATMs in the country. The Bank aims to scale its network to 600,000 banking points. Airtel Payments Bank has committed an investment of Rs. 3000 crore across its national operations. Just a couple of days ago, Bharti Airtel revealed that it had opened over 150,000 savings accounts ever since its inception in Odisha. Interestingly, 30% of the total registrations came from rural areas. Are you mad…..Their is no charge up to Rs 1000 transaction done online……Yes their are charges if you withdraw hard cash…..